I feel like I've shared this story here before, but I can't remember in what post, so just bear with me while I share it again. My 9th Grade Honors World Geography teacher was a brilliant man, a great teacher, and generally some one I really looked up to, but I'll never forget the day in class when we somehow got on the topic of reading. I think one of the students in class mentioned how many times they'd re-read a certain book they loved, and my teacher looked genuinely surprised. He asked the class at large, "How many of you re-read books?" and I'll never forget the look of shock on his face when the majority of students in the class raised their hands (including yours truly). He said that he was not in the habit of re-reading books, and it was pretty clear from his tone that he sort of thought re-reading books was a waste of time. We were a bright class (it was an honors course after all), and he admitted he was very surprised that we, as smart students, would choose to waste our time reading books we'd already read when there were so many left to be explored. With all due respect to my former geography teacher, I disagreed with his opinion then, and I still adamantly disagree. It's not that I don't understand the sentiment. I mean, really, there are so many books in the world, and only one life to get through them all. My TBR list has always been longer than my read list, and continues to grow at a much faster rate (it's much easier to add book titles to a list than to actually read all those books). I could spend the rest of my life just reading all the books published up to this point, but every year thousands and thousands of new books are written and published and my TBR list will continually be growing until the end of time. With so many new shiny books, who's got time to re-read old ones? But here's the thing. There's a difference between reading a book the first time, and reading it the twenty-seventh time. Some books are meant to be consumed once, the story keeping you guessing and thrilling until the last page when all is revealed and the suspense is over. You wouldn't gain much from re-reading those stories because, well, the point in reading it in the first place was to find out how it ended. Now that you know, there's no reason to re-read it. But other books beg to be re-read. Yes, those books have endings too, but knowing the ending of them doesn't mean you know everything about the book. With some books, there is so much in the middle, so much in the layers, so much to forget and be reminded of, so much hidden, that you could re-read those books for a thousand years, memorize every word of them, and still find something new every time you read it. Those are the books I love the most. I found myself doing quite a bit of re-reading last year, and it got me thinking, is this the best use of my reading time? Shouldn't I spend more time reading all the hundreds of other books I haven't read yet? Why am I circling back to these old tried and true favorites? And, well, the answer is different for each one, but often it's because there's something about the book that stays fresh. Every time I read it, I find something new, or feel something different, or (almost even more rare), feel the exact same emotion just as powerfully as the first time through. It amazes me how every time I read Pride and Prejudice I can alternately despise Lizzy for her blindness or find her the most delightful heroine ever written. Every reading of Harry Potter seems to bring that same sense of magic, of getting to know that world a little deeper, of finding new details I somehow missed before. I read a quote somewhere recently (maybe on Instagram, maybe somewhere else) that said a classic is just a book that hasn't finished telling it's story yet. To me, that means a classic is a book you can read over and over and over again. So I've decided, no more apologizing for re-reading. No more guilt. So what if my to-read list is arcing to the moon and back, sometimes what I really want is to know I'm going to love the book I'm reading, not just hope I will based on reviews or plot summary or guesses. And if I've already read it, I already know I'll love it. Below is a list of my top five infinitely re-readable books. At least, these are books that I have actually re-read because I love them so much. 1. Pride and Prejudice by Jane Austen. Well, to be fair, I think everyone of her books is infinitely re-readable. For the past two autumns I've revisited most of her major works, and I've found that to be a delightful tradition that I think I will carry on annually. 3. Jane Eyre by Charlotte Bronte. You know, this is one that is epic the first time you read it (especially if the story hasn't been ruined for you beforehand), but somehow manages to be fantastic on every re-read. Even when you already know how things are going to turn out! 4. Harry Potter by J.K. Rowling. All of them. How do you pick just one? 5. Crossing to Safety by Wallace Stegner. This one is due for another re-read really soon (if only I could get the audio version of it through my library!). It's just beautiful. I feel like this list really pegs me as kind of a stereotypical reader. Jane Austen? Charlotte Bronte? Could I be more cliche? Oh well, I like what I like. Now, this isn't necessarily the definitive list of my favorite books (I've never re-read some of my favorite books, and I've re-read a lot of books I would not consider favorites). And actually, there are other books that I might consider to be "infinitely re-readable" but I haven't happened to re-read them yet (but when I do, I will add them to the list). Also, this list doesn't include any nonfiction, because I re-read nonfiction books for different reasons (that may be a list for another post). But if I ever happen to be stranded on a desert isle and can only bring a handful of books with me, the above list would not be a bad lot to get stuck with. What's on your list of really good re-readable books? Especially on audio, I just never get sick of Harry Potter either! It doesn't feel possible. Oh, and one fun rereading experiment I've started recently is to start re-reading all the books I've given 5 stars to at some point on Goodreads. It's so interesting that many of the reads I gave 5 stars to ten years ago, I wouldn't give five stars to today, so it's been kind of fascinating to revisit those just for the comparison. What a fun project! Although, I've generally found it to be true that my rating of a book generally changes over time, no matter what I give it initially. 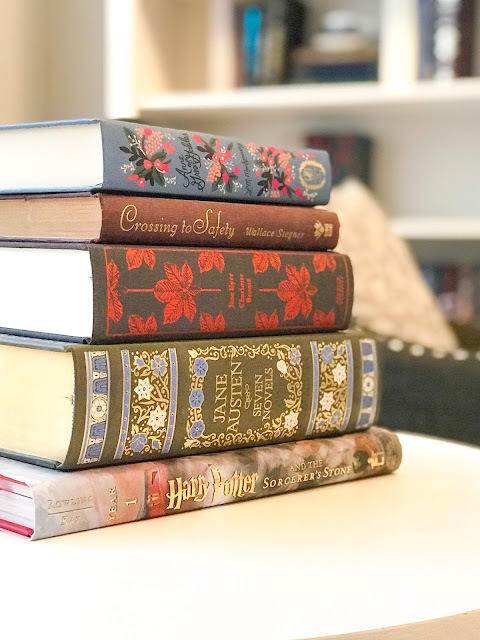 And while the books I listed here are definitely all five star reads, there are many books I re-read regularly that just aren't, but they are fun so I like to revisit them. I did more re-reading last year than I was planning on and I really enjoyed it! Sometimes re-reading for me is a great way to get out of a reading slump. A few re-reads I love (besides many that you mention above): Okay for Now by Gary D. Schmidt, Lions of Little Rock by Kristin Levine, Wonder by R.J. Palacio, A Monster Calls by Patrick Ness, A Tree Grows in Brooklyn by Betty Smith, anything by Steve Sheinkin. Oh and The Snow Child by Eowyn Ivey. Yes, The Snow Child is one I suspect would make a fantastic re-read, I just haven't gotten around to it yet. And apparently I need to add Lions of Little Rock and A Monster Calls to my TBR list! I would also put Stegner and Austen on my re-read list. My list would also contain Everyone Brave is Forgiven, Brideshead Revisited, 84 Charing Cross Road, Gift from the Sea, and How Will You Measure Your Life. This is such an interesting list. I've heard such mixed reviews of Brideshead Revisited, but I really trust your taste so I need to read it some time. Along with the rest of these (I have read Everyone Brave is Forgiven, and I did love it, but not quite as much as you I think). Yep I disagree with your teacher too. Re-reading a great book, something new to discover everytime. Anne of GG for example, reading it as a 12 yr old, 16 yr old, etc etc something different everytime. One book I keep re-reading is Swiss Family Robinson and yet I have a love hate relationship with it, so strange.